How To Display Twitter Feed on Website Using PHP? 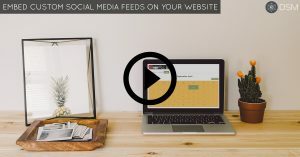 Need to embed a Twitter hashtag feed on your website? Watch this tutorial. Do you actively use Twitter for your brand or products? Does your client use it? If you use it for your brands or products and you have your own website, it will be a great feature if you can display your twitter feed or posts on your website. I know, you can embed your Twitter feed using the Twitter widget, but you cannot customize the look and feel. It looks like the default Twitter interface. Don't get me wrong, it looks good! But sometimes, our design scheme or our clients have a different requirement, they want the Twitter feed to look different. The good news is, our code for today is a way to do it! 1.1 It gets a Twitter users's profile information and posts from a specified twitter account. 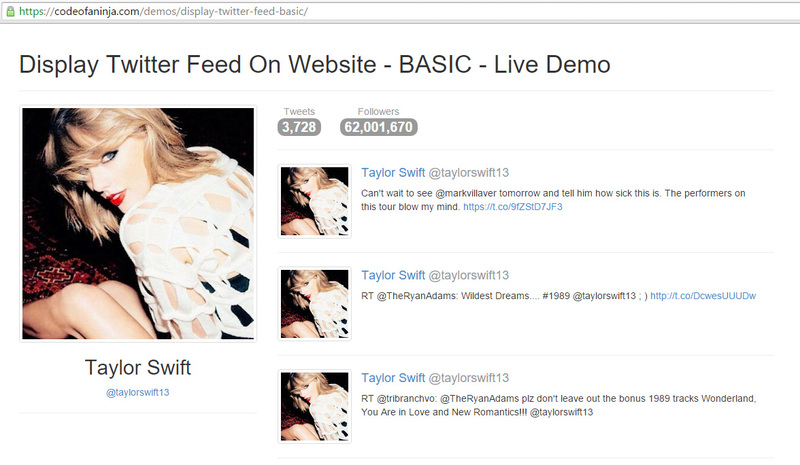 We'll try Taylor Swift's twitter account in the demo. 1.3 Show some awesome UI powered by Bootstrap. If you’re not yet familiar with this awesome front-end framework, see our step by step Bootstrap tutorial here. See the full list of features in section 15.0 below. It has all the details of these features. 3.1 Go to Twitter Apps page. 3.2 Click the 'Create New App' button on the upper right corner. The index.php file will have the following code. The following code will be inside the DIV tag with class="col-lg-4". Access token and keys value were retrieved during our section 3.0 earlier. // we are going to use "user_timeline"
OAuth is an authentication protocol that allows users to approve application to act on their behalf without sharing their password. 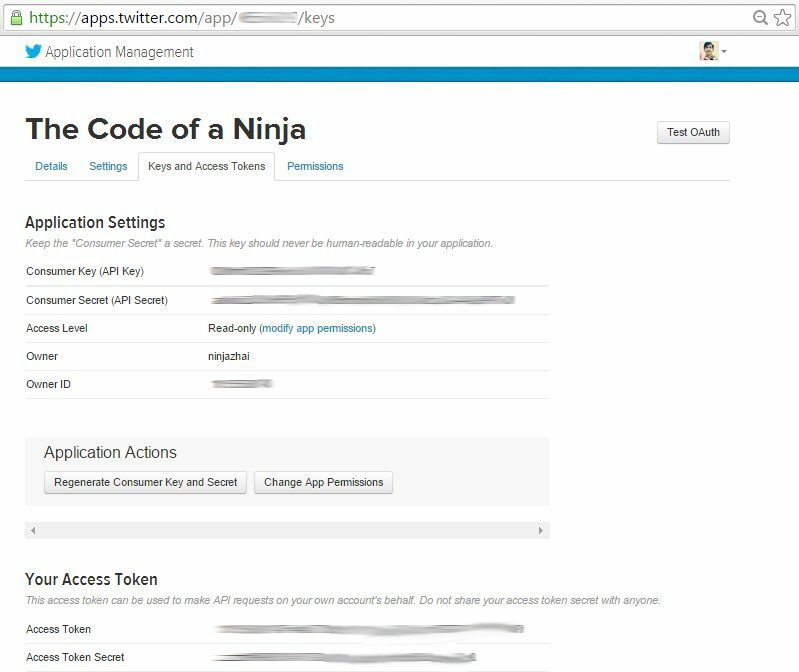 More about Twitter OAuth here. We can now make request to the Twitter API with the help of $oauth variable and cURL. Now we will put the following code inside the DIV tag with class="col-lg-8". Finally we can now display the user's Twitter posts. The following CSS code is what I used to add a some style on our page. I put it inside the "head" tag, just below the Bootstrap CSS. 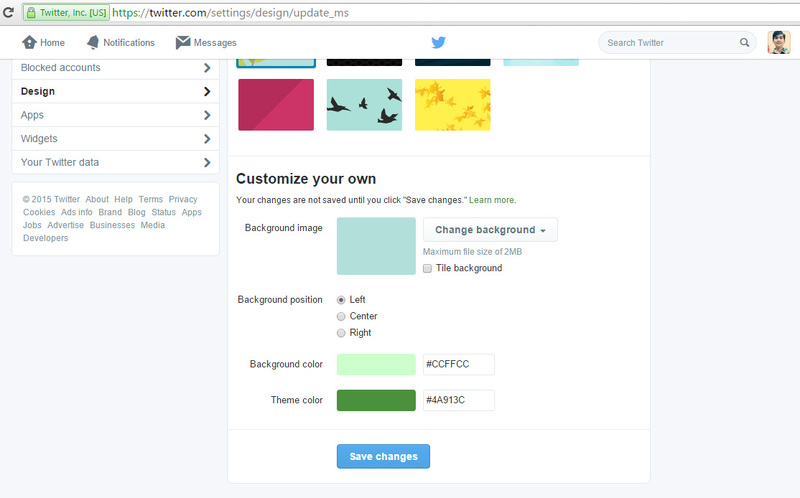 You can control or change the background or link colors by going to the design settings section of your twitter account. On the upper right corner of the page, click your picture. Click "Settings" in the dropdown. On the left side bar, click "Design". "Theme Color" is the link color. Changes made here will reflect in your page using the LEVEL 2 source code. For a limited time, I will give you the source code for a low price. DOWNLOAD THE SOURCE CODE LEVEL you desire by clicking its the BUY button below. Thank you for supporting our projects here at codeofaninja.com! 15.3 Do You Want a Demo? If you want a demo to see if this will work with your own Twitter account, please send me a message via email mike@codeofaninja.com, or via our official Facebook page! Please provide your Twitter username on the message, thanks! BONUS! The following script does not have LEVEL 3, only LEVEL 2. We will give them to you as bonus. Read more about this package. Today we have learned how to show a Twitter Feed on your website. Did you know that you can display Google+ Feed on your website as well? Let us go to the next tutorial: How To Display Google+ Feed on Website? 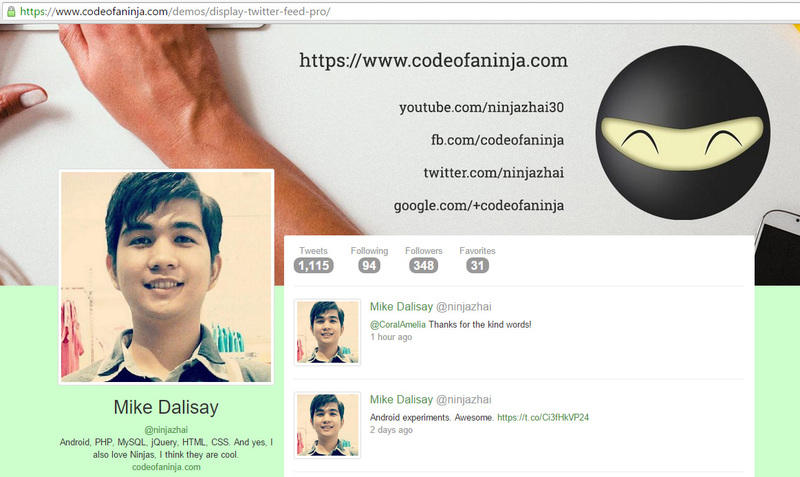 Thanks for visiting our tutorial on how to display twitter feed on website using PHP! https://www.codeofaninja.com/wp-content/uploads/2015/08/display-twitter-feed-on-website-1-1.jpg 393 750 Mike Dalisay https://www.codeofaninja.com/wp-content/uploads/2019/03/codeofaninja-with-text-3-1030x206.png Mike Dalisay2015-08-14 11:55:142018-05-28 23:00:26How To Display Twitter Feed on Website Using PHP? Nice script, I would like to buy the All-Pack, one question, talking about Facebook one, does it rely on php sdk? which version? Hello @ttwist, glad you found our code nice and thanks for your willingness to purchase and support our source code development! To answer your question, we did not use any PHP SDK, Facebook graph API is an HTTP based API so you can access data via URLs. Just another question, on both twitter and Facebook I just want to pull what I post, not all peoples posts on my wall, or comments, etc. Is this possible with Pro version? 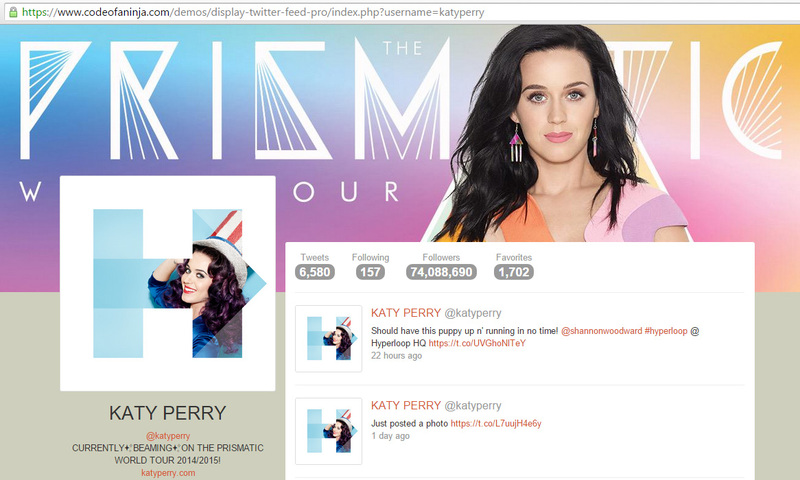 Hello @ttwist, on our Twitter source code, you can use it with any Twitter account with public posts. On your Facebook scripts, you can use it with any Facebook pages, not personal account. Is is posible to show (retrieve) the images posted along the tweet and Facebook post? Hello @ttwist, do you mean show the Twitter and Facebook posts in one feed? Our script cannot do that. Your code is too good.. I want to buy this package.. and is it possible to display only live videos of twitter user??? Hi @jagumavani:disqus , thanks for the kind words! Unfortunately, our script don’t have that feature yet. Can you plz share your idea how to do it? Your Problem: You need to display your Twitter feed on your website. But YOU DON'T LIKE TO CODE. 2. Fully customize the look and feel of your Twitter feed instantly. 3. Show posts from your Twitter account to your website automatically and in real-time.